WRT Planning and Landscape Architecture teamed with Michael Singer Studio to develop an expansion plan for Chicos FAS Corporate Campus and its associated women’s designer apparel brands. The team explored several strategies to join the new north campus area with the existing south campus facilities. The primary concept for the re-visioning of the combined campus was the notion of “Sanctuary” – a place where workers and visitors could feel relaxed and distanced from the surrounding urban context. This concept integrated the two campuses by activating the outdoor spaces between them with pavilions, outdoor conference rooms, athletic facilities and naturalized garden spaces. 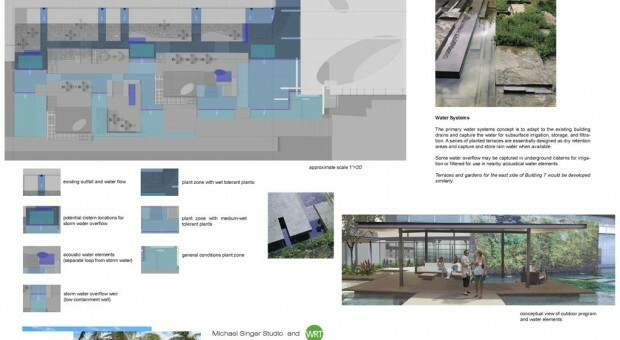 Michael Singer Studio was involved in all aspects of the facility re-design, but focused primarily on ecologically regenerative spaces within the project that integrated pavilions, covered walkways, covered courtyards, garden meeting spaces, interior / exterior sculptural water gardens, façade treatments and living walls.